Don't forget to enter to win the Betty Crocker Gluten Free Baking Mixes giveaway!! New Nasoya® Silken Creations is a rich, creamy pudding-like base that cuts the calories, fat and gives a jump start to all of your favorite dessert recipes from pies and cakes to frozen treats and smoothies. It’s even a decadent treat right out of the package! Naturally flavored, lactose & dairy free, low in fat & calories, vegan, and gluten free, Silken Creations comes in three popular flavors, Dark Chocolate, Vanilla and Strawberry. Made from whole soybeans and sweetened with cane juice, Silken Creations is low in calories (only 110-130 per half cup serving), low in fat (only 1-1.5 grams) and is a good source of protein (3-4 grams). Of course, I dove into the chocolate first. I wanted to see what it tasted like by itself so I just grabbed a little dish and served some up plain. It was delicious! 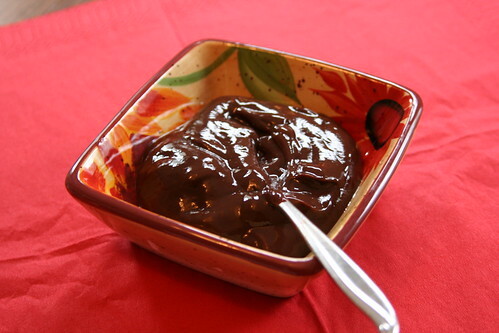 A smooth, dark chocolate pudding. I just found a recipe on the Nasoya website for a chocolate peanut butter pie. I am definitely going to make that soon! 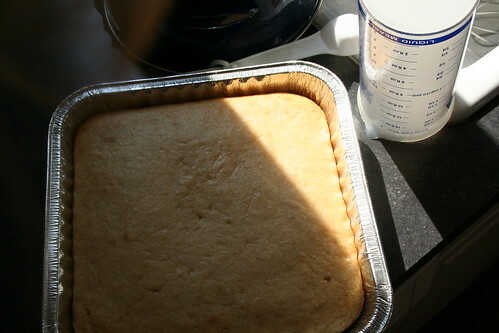 Ironically enough, the day before I received the package, I had read a recipe on Carrots n' Cake that used the vanilla Silken Creations to make a simple "vanilla" cake. I thought that would be perfect for the 4th of July weekend. I used the recipe exactly as I found it (not gluten free). 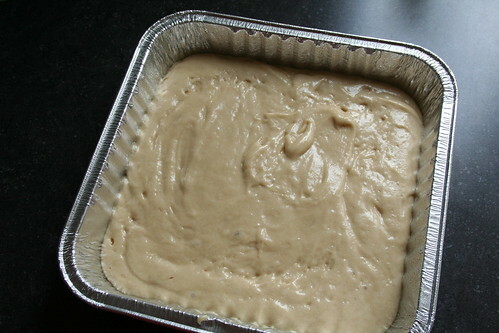 The cake smelled really good, but honestly, the taste was not good at all. Very blah, tasteless, not good. Tina said her's was delicious, so maybe something wasn't right. I had brought the stuff down to my Mom's house and the silken creation had kinda melted so maybe that was the issue? I'm not discouraged though, I'm looking forward to doing something different with the other package of vanilla. As I was resting on the couch at my Mom's on the 4th, I overheard some family members trying the cake... they agreed.. not good!! I have not tried the strawberry yet so look for that post soon! I definitely recommend these products for many dairy free uses, the website has tons of recipes, check them out! That is a great product review. I always find it so helpful when people give honest feedback on new products they've tried because it can save us lots of time and money. I can't eat cane juice - otherwise I was going to try to make ice cream with it. The cake looked good even if it tasted bad. Starbucks: Let Us Eat Cake!!!! One of the proudest days of my life. 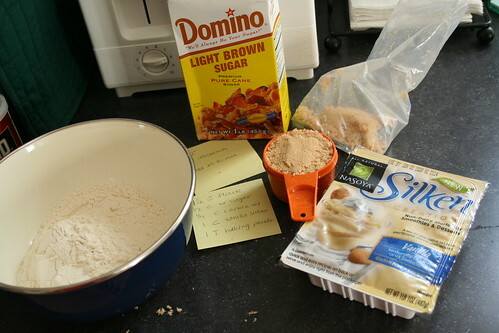 Betty Crocker Gluten Free Baking Mixes!! !